The most recent history of Huntington Beach is 100-year venture into tourism, oil & space exploration and soft industries with corporate headquarters locating to the city. Huntington Beach's rich history of photos began with the Newland House, the Red Car, a pleasure pier, ocean plunge, pavilion and attractions not strikingly different from today. Shortly after Huntington Beach adopted its name, an oil boom began when several veins were discovered on the land near the beach. For approximately 100 years, the derricks, offshore platforms and pumps have dotted the terrain and appeared in the landscape of photographs. While the pumps surprisingly still sit next to houses, a hotel in the downtown region and are plentiful near the wetlands, many have been capped as the price of land goes up. This picture gallery includes an assortment of photos obtained through various sources and is brought to you for your enjoyment. We'd like to thank those who have contributed to the cause of helping educate and remind us of our roots in the West Coast Mecca of Huntington Beach, California, also known as Surf City. Surfing a wave near the Huntington Beach Pier has been a tradition for nearly 100 years since the sport of surfing was introduced to Huntington Beach. The coastal history of surfing is as fascinating as the characters who have carved their reputations on the Pacific waves. Just down the road 10 miles or so south of Huntington Beach, for instance, sedate Corona del Mar was once a hot surfing spot until manmade jetties were built to kill the fantastic waves that rolled in there. 10 miles to the north of Huntington Beach, Long Beach sees no waves for surfing either. All the channels and jetties built there make it nearly impossible for waves to break offshore enough to surf. 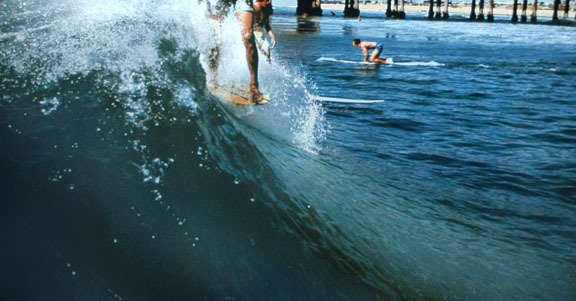 Huntington Beach has kept its waves and show that though some things change, others remain the same. Those who have visited or lived in Huntington Beach for more than 10 years may remember the oil derricks along Pacific Coast Highway. Walking to the beach, surfers, tourists and locals all had to walk around them to get to the ocean. Finally, they were capped and none remain along the waterfront. Tourists often send emails asking if the oil platforms along the ocean are noticeable and create an atmosphere not pleasant for visiting. The answer is that while you will have these platforms in some of your scenic photos in which you include ocean vistas, they are situated offshore far enough that they are not strikingly noticeable. Today, you can see an occasional machine pumping oil near a house, at the wetlands or even along Edwards Hill and Golden West streets. But you will not see anything like the picture above, taken years ago.